I have a serious case of knitter's disease. When I see a factory-knit garment, I simply can't bring myself to buy it. No no, I have to examine it, dissect it, and make my own version. 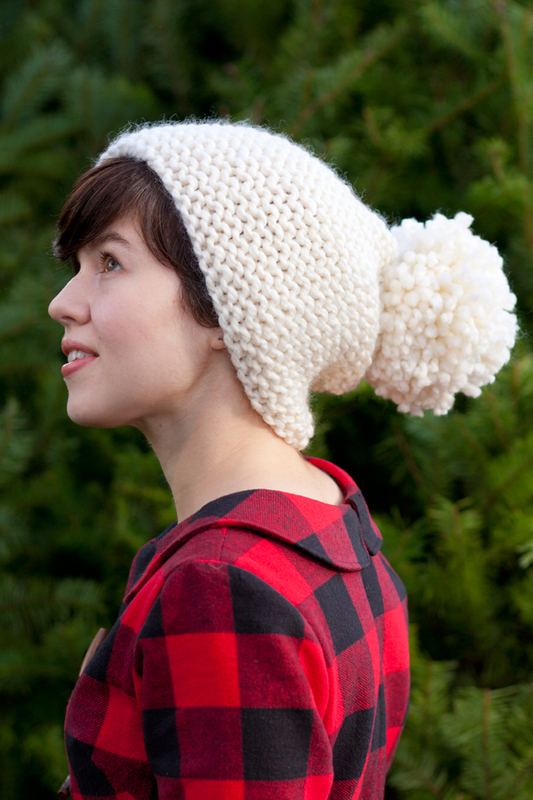 Naturally, when I saw this Anthropologie Pom Beanie, my first thought was: "Thick yarn? 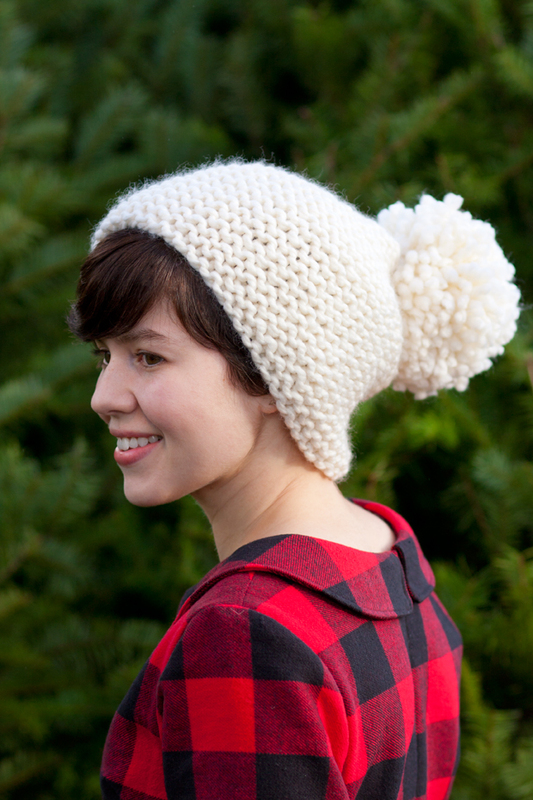 All garter stitch and a big ol' pom-pom? I can make that!" 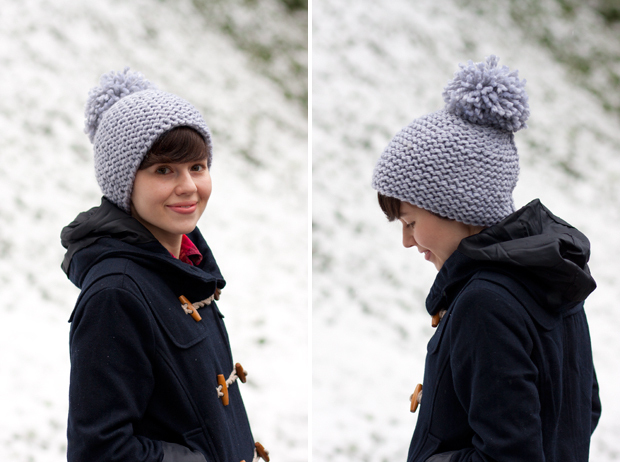 And the only thing better than making one for myself, is sharing my pattern with you! 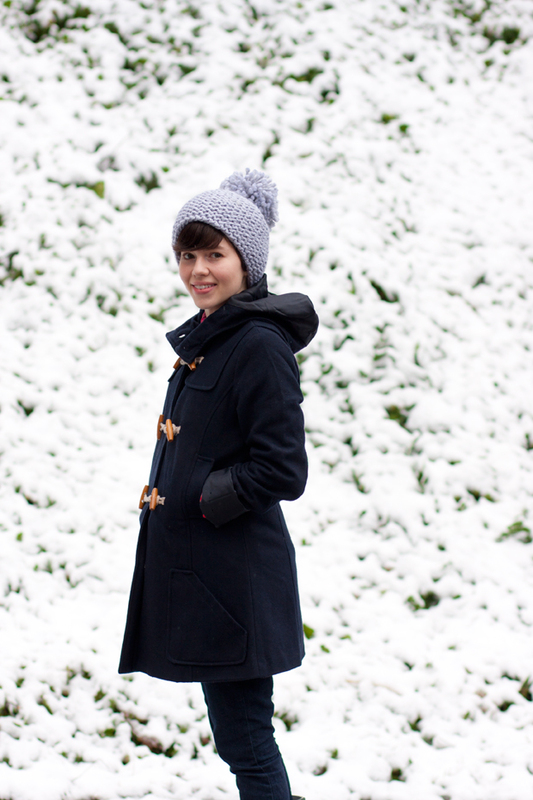 These hats are so fast and easy to whip out, there's still plenty of time to make a few for the fashionably-inclined women in your life. Just put on your favorite Christmas movie (Elf? Scrooged? Christmas Vacation?) and you'll be about finished by the time it's over. 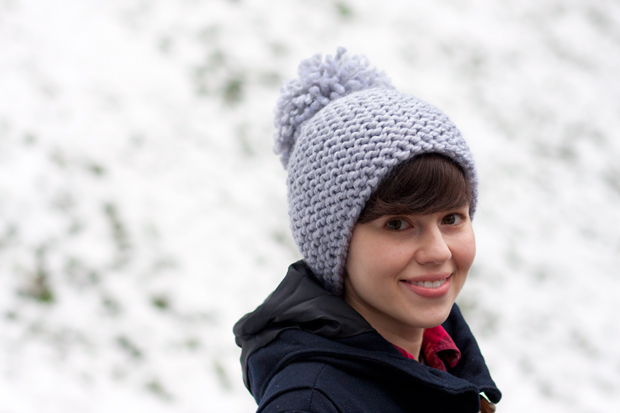 I wanted to make it beginner friendly as well, so this hat is knit flat- no knowledge of circular or double-pointed needles necessary (though, of course, you can easily join it and knit in the round, if you'd prefer). 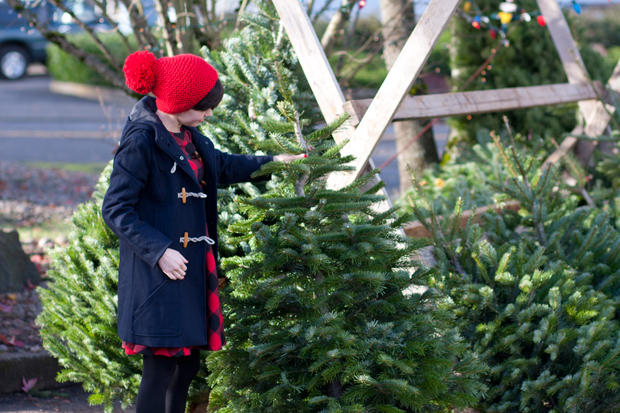 So here's a little Christmas present from me to you. Click here to download the free PDF. P.S. Please feel free to comment if you find anything confusing in the pattern. I want to make it as easy-breezy as possible! What a darling hat! And how convenient that it snowed just in time for the photograph. 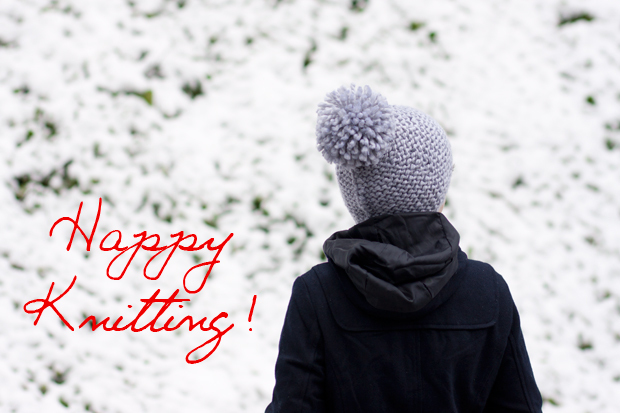 I am sending this post to my friend who is new to knitting. It's perfect for her. Absolutely wonderful hat, Jessica! Gotta make it. Thanks for dissecting and creating for all of us! so what if we dont knit, do you sell these? I love the grey! Hi Kate! I'm not currently selling them, but I'm always looking for feedback about the kinds of things people would like to see in my Etsy store, so I'll put these on the list. Thanks for asking! Cool! What is the name of your etsy store? @Kate The name of my etsy store is also Is + Was. If you click the "Shop" tab at the top of the page, it'll take you right there. It's not open yet, but I'll put the pom-pom hat on my list of things to stock once I get it open! So glad you like the pattern, and I'm thrilled that you shared it on your blog! By all means, link away. :) I checked out your hat too, and it looks great! Holding the Corriedale-Alpaca tripled worked perfectly. Thanks for visiting! I just finished making this hat and I have to say that I am rather very disappointing as the hat could not fit me and it barely fit my toddler daughter. It could have been my yarn but I doubt that, I dont believe that 48 stitches is quiet enough for an adult head. I was quiet disappointed that this hat did not fit as I was really looking forward to wearing it. Guess I will look for a different pattern. hi the link to the pattern does not exist anymore, is there somewhere else I can find it? Could you please post the pattern again? I'm in love with this hat! Can you post the pdf of the pattern again? The link isn't working. Thanks for this! I whipped this up - my first ever hat! - the last couple of days. It's adorable, and your pattern was very easy to follow! Is + Was is chock-full of projects, recipes, and the things that inspire me: sewing, knitting, decor, fashion, and food! You're welcome to use or pin any photos you find here, with credit and a link. You can also follow me on Pinterest, or e-mail me at isandwas@gmail.com. All photography by me, unless otherwise specified.